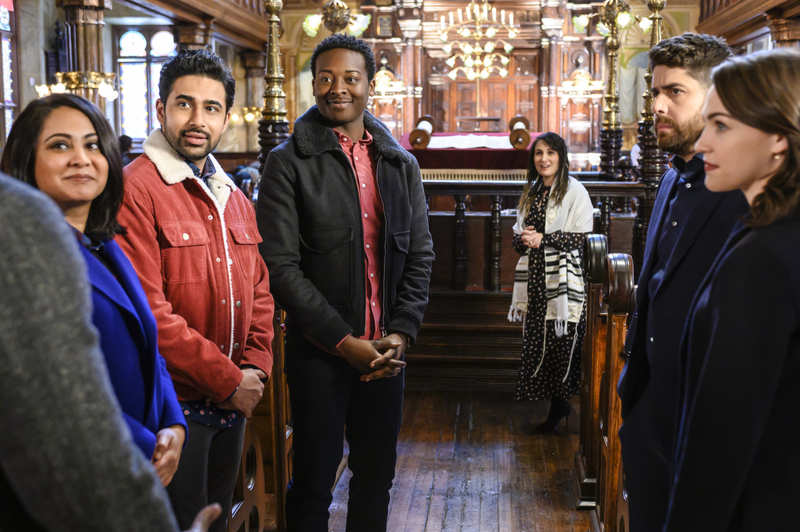 Preview images for the God Friended Me season finale which is called "Que Sera Sera"
Miles, Cara and Rakesh finally come face to face with the elusive Henry Chase (Derek Luke) when the God Account sends Miles Simon Hayes’ (Adam Goldberg) name, on the first season finale of GOD FRIENDED ME, Sunday, April 14 (8:00-9:00 PM, ET/PT) on the CBS Television Network. There’s a lot of recurring cast guest starring in this episode, and that recurring guest cast includes Erica Gimpel (Trish), Adam Goldberg (Simon Hayes), Parminder Nagra (Pria), Robert McKay (Lester), Tracee Beazer (Diana), Jeremie Harris (Graham), Navid Negahban (Hassan), Nneka Okafor (Christina), Daniella Rabbani (Rabbi Zoe), and Francesca Ling (Parker). Additional guest stars include Jennifer Regan (Sharon Katz), Jessica Cherniak (Erica Katz), Jessica Lu (Woman), and Derek Luke (Henry Chase).